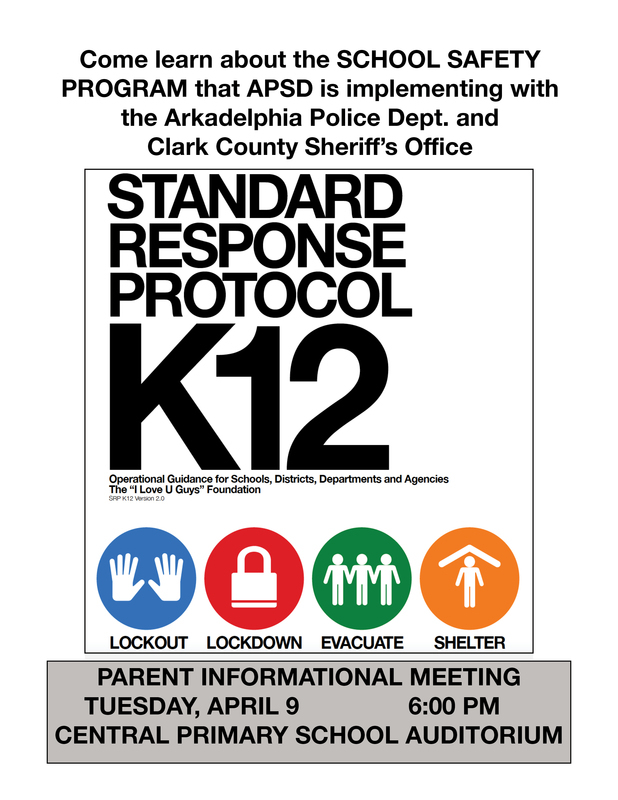 The Arkadelphia Public School District, in conjunction with the Arkadelphia Police Department, will hold an informational session for parents and community members regarding the Standard Response Protocol (SRP) school safety program on Tuesday, April 9, at 6:00 pm at the Central Primary School Auditorium. APSD is implementing the program, produced by the I Love You Guys Foundation, along with APD and the Clark County Sheriff’s Office throughout the district from pre-K to high school. District representatives invite parents to this information session that will explain the program and what to expect during various emergencies that might occur during the course of a school year. “Over the course of this school year, this program has been explained to our students at all levels in a variety of ways,” said Dr. Jeanette Turner, APSD Director of Instruction and Curriculum who has been working with APSD SRO Dewayne Ward on the implementation of the program. “These have varied at different campuses with age-appropriate presentations training our students what to do in different circumstances. The Standard Response Protocol teaches students, staff and parents what to expect during four different situations: lockouts, lockdowns, evacuations and times to find shelter. The informational session on April 9 will explain the SRP program and help parents know that their students have been instructed to do, but also what is expected of and needed from parents during emergency situations. “Hopefully through this session and continuing to find different ways to inform parents of our procedures during emergency situations, we will all be on the same page and can minimize issues in the unfortunate event that an emergency sitiation arises at one of our campuses,” said Turner. The program will last about an hour and parents will be able to take home a flier with information regarding the SRP home with them to help as a learning tool as well. For more information on the program, visit www.iloveuguys.org .